If you know me at all you know how important mental health is to me. Not just personally, but also professionally. I knew that I needed to read this book as soon as the blurb about it showed up in my inbox. I knew that I would be drawn to the author and her story. I knew I'd need to hear her voice and learn firsthand what her life has been like. 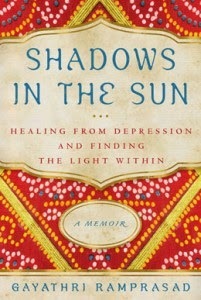 Shadows in the Sun: Healing from Depression and Finding the Light Within is a tremendously powerful book. Gayathri Ramprasad opens her heart and shares her intense experience of life with depression. Gayu (the nickname her family calls her) starts off writing about her youth. She sounds like a sweet, young girl who seems to be enjoying her family, her community and her culture. She shares intimate details of her relationships with her parents and her siblings. And then she shares her breaking point. She finds out that she failed one of her college classes and becomes inconsolable. The panic, emotion, physical pain and revulsion she experiences seems beyond words - and yet she finds the right ones to describe and define it all for us, her readers. She is growing up in India and the doctors say there is nothing wrong with her. Her parents do not understand what she is doing or why. Her siblings stand by and watch, waiting for another collapse. The mental angst she experiences has her physically ill. She loses weight. She cannot eat food, or keep down anything she does eat. She is terrified. Her mind races in fear. And during this bizarre period of her life she finds herself feeling alone. Her family tries - but they just do not understand. She rights things for herself, eventually passing her course and finding some hope. She gets married (arranged by her parents) to a gentle and supportive man named Ram. Shortly after they wed he has to return home to America while she waits impatiently for her green card. She finds a way to survive the day-to-day at his parents' home. She maintains minimal connections with her original family. She functions. Barely. Her new family, she is terrified they will see what she is hiding. Her husband cannot know how very broken she is. Gayu's life throughout just about the first half of this book is bumpy, but she seems to have found a way to make things right once she joins her husband in America. She adjusts to this new world, this new way of life. She and Ram start a family of their own. And then her walls crumble around her. She falls headfirst into postpartum depression. It is not until Ramprasad returns home to India with her new baby that she finds a reason for all of this twisted medical history. She is finally diagnosed with clinical depression. There is so much more to her story. So much we watch her go through. So much someone like me can understand and relate to. I'm so relieved to see her finally receive a diagnosis. A name for what it is she experiences. But I am so sad about all of her continued fears. I won't detail everything here as I'm not that kind of a book reviewer. And also because her story is so detailed and important, it'd be better if you read it yourself. But, as you can tell when you pick up a copy of the book, Gayathri Ramprasad is an incredible survivor. She is currently an advocate for mental health awareness across the globe. She has established her own nonprofit organization that promotes personal, organizational and community wellness. You can find out more about the organization over at myasha.org. Gayu is a survivor. She's a prime example of what a diagnosis, support and understanding can provide for someone suffering from mental illness. If you or someone you know is exhibiting symptoms of depression or postpartum depression, please consider reaching out for help. Some important resources available to you are listed below. Don't hesitate to take that step. You might just save a life. If you are experiencing waves of fear and anxiety that lead you to considering hurting yourself, please reach out immediately to suicide hotlines. The National Suicide Prevention Lifeline can be reached at 1-800-273-8255. To purchase your own copy, click below. This book looks inspirational and since my trip to India in November, I know a little bit of what she might have faced. I'd love to win it for that reason. This is an important book and post. Mental health should be at the forefront of the media, so that we not only discuss it but that more research addresses the needs of so many. What a valiant woman. I feel for what she went through and hope she's found the right balance of therapy and medication. Wow! This sounds absolutely amazing. I will definitely need to pick it up. I've struggled with my mental health for years and as I am getting older, it's getting harder. Thanks for the review! The author has certainly experienced many challenges. I love that she is using her own difficulties to help others.